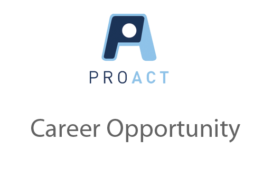 Job Posting - Site Supervisor - Red Wing - ProAct, Inc. Serving people with disabilities for more than 45 years. Requirements: *High School diploma or general education degree (GED) with further training in health/rehabilitation or production preferred. Six months related experience and/or training; or equivalent combination of education and experience. *Must possess excellent written and oral communication skills. *Must be CPR and 1st Aid Certified. *Must pass DHS background study. *Must possess valid driver’s license with acceptable driving record; must be insurable at non-risk rates. *Must be able to lift and/or move up to 50 lbs. *Must be able to pass DOT Physical (additional testing required as a result of DOT physical will not be paid by ProAct); drug and alcohol testing. *Must have personal automobile and be willing to drive for company business. Job Description: Provides training, individual job coaching, site supervision and supports individuals with disabilities in a manner the enables them to achieve their goals and objectives. Transports crew to work site on a daily basis. Supervises work group including but not limited to setting up work as assigned and/or getting work assignments for individuals, trains individuals on new assignments, monitors quality and quantity of work produced, assures work is completed on timely basis and in a manner consistent with the employer’s standards.